The first time I encountered rum raisin ice cream was on the coast. It was a warm afternoon and a small vendor nearby was selling creamy, homemade ice cream. From the sheer amount of people vying for a scoop, it seemed only appropriate to do just the same. Scattered among the classic flavors were more unique tastes, including a caramel swirled rum raisin ice cream that looked so divine I didn't look twice elsewhere. As I approached the counter with wide eyes, a wad of dollar bills scrunched in my hand, I told the man exactly what I wanted. However, because it was made with real rum and I was still underage, the rum raisin stayed out of my twenty year old reach. I walked away, dragging my feet on the sidewalk, with a simple waffle cone in tow—my consolation prize. Nevertheless, my rum raisin woes were quickly assuaged by the melting, chocolate ice cream in my hand. Ice cream often cures all sadness and woes; even those caused by ice cream itself. I've never met a situation that ice cream couldn't improve. Still, I find it fitting that the very first time I would be carded would be for something so innocent as an ice cream cone. This Rum Raisin Ice Cream is to make up for that doleful moment of my youth. This is for all of the underage, twenty year olds who have been turned away from ice cream cones. This is for those who need a little extra cheer. This is for those who need a reward after a long, hard day's work. This is for those who deserve a sweet treat for absolutely no reason at all. This Rum Raisin Ice Cream is everything I have dreamed (and more). 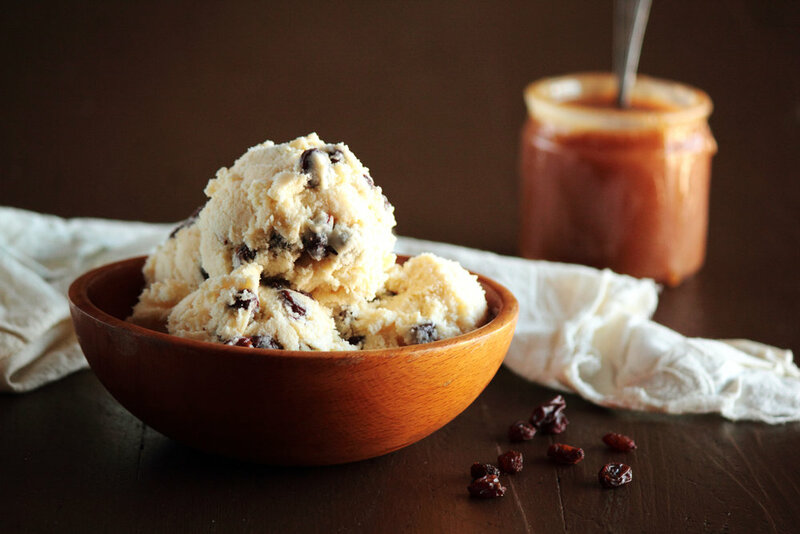 Rum soaked raisins are diffused through a creamy, smooth ice cream (which has just a hint of rum itself). While it does taste delicious plain, I love to drizzle this ice cream with a warm, rich caramel sauce. I highly suggest you do the same. Rum, raisins, and caramel are a trio of flavors that, when combined, may leave you obsessing over them days (or weeks) later. In a small saucepan, place raisins and dark rum. Bring to a simmer over medium heat and simmer for a couple more minutes before removing from heat and covering with a lid. Allow to soak for at least 2-3 hours. Meanwhile, whisk together milk, sugar, and salt in a medium saucepan. Heat on medium heat until steaming. Remove from heat. In a separate bowl, whisk the egg yolks until smooth. Slowly pour in warmed milk while whisking rapidly to prevent the yolks from curdling. Return mixture back to saucepan and cook over medium heat, stirring frequently, until the milk forms a custard thick enough to coat the back of a spoon. Strain mixture and chill in the refrigerator for at least 1 hour. Before placing in an ice cream maker, strain the raisins, pouring any extra rum into the ice cream base. Freeze mixture in ice cream maker, following the manufacturer's instructions. In the final minutes of churning, add the raisins so they spread evenly throughout the ice cream. Transfer ice cream to an airtight container and freeze for 2-3 hours before serving. Serve chilled, drowned in a sea of warm caramel sauce.